I finally moved into an apartment after living with the missus’ family for way too long, so I’m currently renting a spacious two bedroom place down the road from her parents for US$250 per month. It’s a decent crib, at least by Bolivian standards, though I suspect that it might be a murder house, but more on that later. Given that the internet is still in its infancy here, searching for a place is a lot more difficult than it should be. There are at least half a dozen classifieds websites in Bolivia, but none of them are particularly popular. Each might have only one or two listings per week so they’re generally a waste of time. Most people look for houses the old-fashioned way, through the local newspapers, which is fairly inconvenient for a number of reasons. Advertisements are rarely sorted by location or price, so you have to read 100’s of them to find something you might want. The newspapers charge per word. To save a few Bolivianos, property owners will omit important details such as price, location or number of bedrooms. This means you will have to ring about 10x more people than necessary. There are no photos so you’ve got no idea about the quality of the house you are going to inspect. This means you inspect about 10x more houses than necessary. El Diario uploads property classifieds daily to their website which is currently the best way to search but still suffers from the above problems. Another popular way to search for a place is through local bulletin boards which are scattered across the city with the biggest concentration being on Ave Buenos Aires. 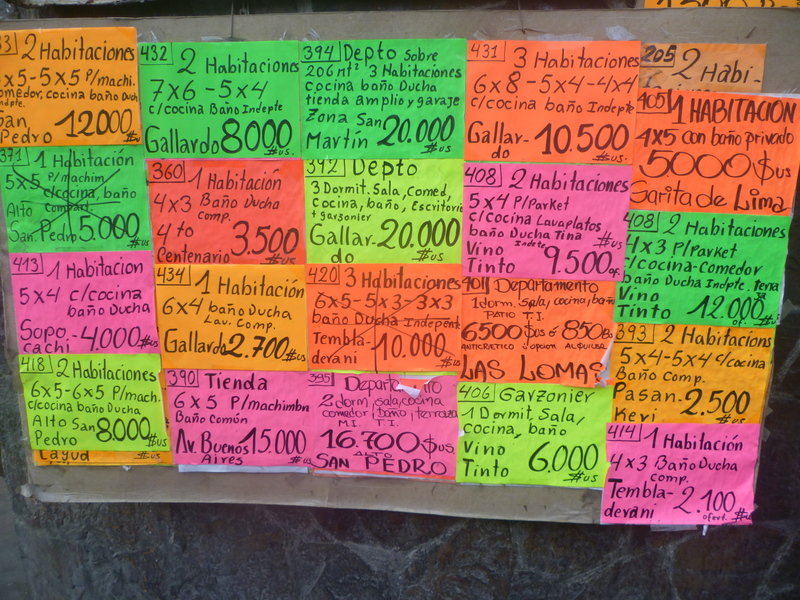 The boards contain various colored papers containing details of properties for rent, sale or anticretico. If you see something that interests you, a lady in the shop out back will sell you the landlords phone number for about US$0.70c. There are various downsides to this method as well. You have to travel to these bulletins boards and stand around in the cold reading them. You often pay for a number to ring a property only to find out it’s already been sold. The plus side to all this stuffing around is that housing is amazingly cheap by western standards. To rent a modern, furnished 2-3 bedroom apartment in a posh area of La Paz (Sopocachi or Zona Sur) is around US$500 per month. Many foreigners look for flat mates through couchsurfing to drop the price even further. Outside of the center, prices fall dramatically. For example, I’ve seen rooms advertised for $30 per month, although I imagine they are akin to a jail cell. So, back to my apartment. There are a number of reasons I suspect it may have been the scene of a gruesome crime. The previous tenant must have left in a hurry because they didn’t bother to clean anything, meaning my missus and I had to spend hours getting the place up to scratch. Normally a landlord takes an excessive amount of money out of the bond if the tenant doesn’t leave the place in good condition. The previous tenant left without paying their electricity bill. The landlord had to cover this out of the previous tenant’s bond money, which is unusual. The family across the hall has installed an industrial strength gate in front of their apartment, which seems overkill even for Bolivia. Perhaps they have taken extra security measures after close exposure to a grisly crime. Our floors have been heavily sandpapered which has ruined their quality finish. We saw the floors of the identical apartments upstairs and they look way better. Ours may have been sandpapered to remove some suspicious stains. There are some red splotches in a two meter radius in the living room. Some are smudged as if someone tried to scrub them clean while others are scattered droplets. I’m certainly no CSI, but it does make me wonder. This entry was posted in living and tagged anticretco, apartment, Bolivia, housing, La Paz, real estate, rent, rental contract. Bookmark the permalink. Oh wow! Living in a murder house is pretty exciting.